Ryanair is cancelling hundreds of flights. Travel Editor Pól Ó Conghaile answers your questions on passenger rights. Why is Ryanair cancelling flights? Ryanair is cancelling up to 50 flights a day for the next six weeks as it moves to reduce a backlog of holidays for staff and improve punctuality. The airline has apologised sincerely to affected customers for what it says is "clearly a mess". But there is widespread outrage at the sudden action. The Irish Travel Agents’ Association says it shows “utter disdain” towards consumers, and the airline’s share price has been plummeting. Read a full explainer on the cancellations here. How many flights are affected? The airline says ‘less than 2pc’ of its schedule will be affected over six weeks. However, that’s a busy schedule. 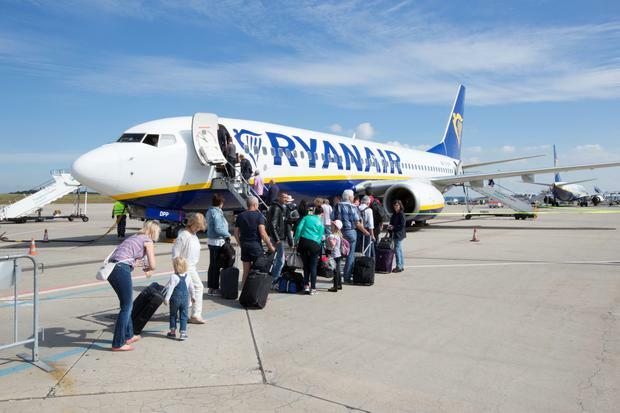 Ryanair's Boeing 737-800s seat up to 189 passengers - filled to 97pc capacity (the airline's load factor for August), that could mean over 9,160 customers are affected every day. The latest lists of cancelled flights are here. How do I know if my flights are affected? Flight cancellation rights are covered under EC Regulation 261/2004. Ryanair’s website includes the steps to process your own refunds or bookings here. These should be refunded back to the original source of payment within seven working days. I'm overseas. My return flight is cancelled. What now? Ryanair has a duty of care to you (see above). Go to the airport, where it must offer you care and assistance until it can get you home. If you choose to fly with another airline or get home another way, you don't have the same rights to care and assistance, and may have a hard time claiming compensation (see below). I’m flying within the next six weeks. What do I do? Ryanair's failure to quickly release a full list of cancellations has been a huge source of frustration for passengers booked (and booking) to travel. Since it announced the cancellations last Friday, it has continued to sell flights for the next six weeks, and 'autumn getaway' sale fares from €19.99. A full list is expected today. Before it is released, any rearrangements you make are at your own expense. Ryanair is not obliged to offer refunds or re-routing for any flights that have not (yet) been confirmed as cancelled. Financial compensation depends on the flight length and the reason for the cancellation. It ranges from €250 (short-haul, less than 1,500km) to €600 (long-haul, over 3,500km). 1) If you receive less than seven days notice of cancellation and choose to be re-routed as soon as possible, you will NOT be entitled to compensation - provided your new flights depart within one hour of the original departure and land within two hours of the original arrival. 3) If you receive notification of two weeks or more, you will NOT be entitled to compensation - provided, of course, that the airline offers full re-routing or refund options. So far, Ryanair has been apologetic and not invoked any "extraordinary circumstance". The Commission for Aviation Regulation has been speaking with Ryanair on the matter. If you're not satisfied with its response, then you can escalate by contacting the Commission for Aviation Regulation (01 661-1700; flightrights.ie). How can my travel insurance help? In the event of a flight cancellation, the first source of refunds and re-routing should be with your airline. Standard travel insurance policies don't offer much help here. However, if your policy includes extra cover for "travel disruption" you can be covered for additional transport or accommodation costs up to €1,000pp, according to Ciaran Mulligan, Managing Director of Blue Insurance. Travel Disruption cover costs extra, and though you can add it retrospectively to a policy, you cannot add it to claim on an event that has already happened. Also worth noting is the fact that it covers transport and accommodation-related expenses only - i.e. not a host of other potential losses, ranging from lost annual leave or business opportunities to deposits, concert tickets or museum or attraction fees booked in advance online. If a given flight isn't subject to disruption, technically you are not entitled to any care or compensation. However, airlines can take a logical view, and have been known to work with passengers to refund or reschedule flights impacted in this way. Check with it for details. For full details on your air passenger rights in the event of cancellation, delays and more, see flightrights.ie. What happens if my flights are cancelled?